This kids playhouse is fantastically adorable! A little home is an amazing and unique way to provide kids with a place to play and be creative. The lovely little cottage, sits beautifully in a backyard area, providing a safe indoor and outdoor space for the kids. 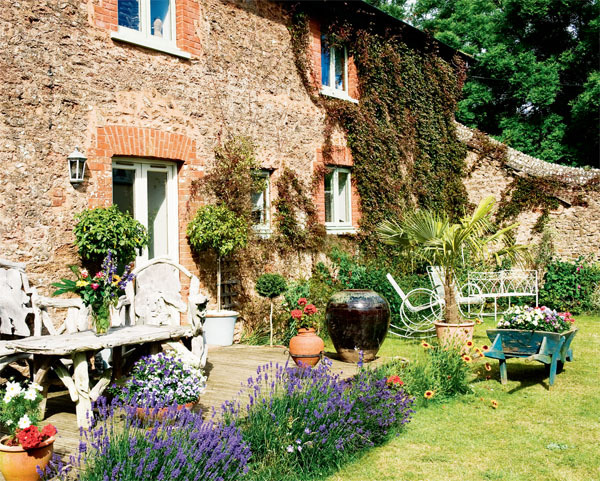 Creme and brown, look wonderful together on the exterior of this one room home. 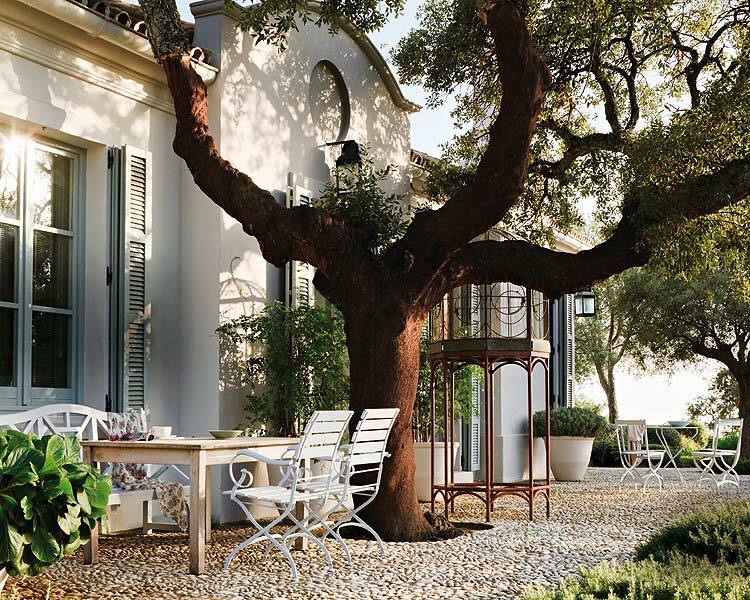 Two beautiful wooden chairs sit on the outside, giving the little ones some outdoor space. A black lamp is hung on the exterior of the home, providing light, when the sun starts to go down. A large window, with a little flower bed beneath it, designates the middle of this kids playhouse. The interior of this kids house is just as charming. Small, stylish, polka dots are used everywhere, creating a fashionable and fun atmosphere. Neutral polka dot curtains hang on the windows, white and gray polka dot wallpaper covers the walls, and a comfy polka dot sofa sits on the side, in this kids house. White clean-lined furniture provides liberal space for the kids to draw and read. The drawers in the desk are black and beautifully contrasted with the white furniture. The dark wood floors are wonderfully suited for the interior of this kids playhouse. 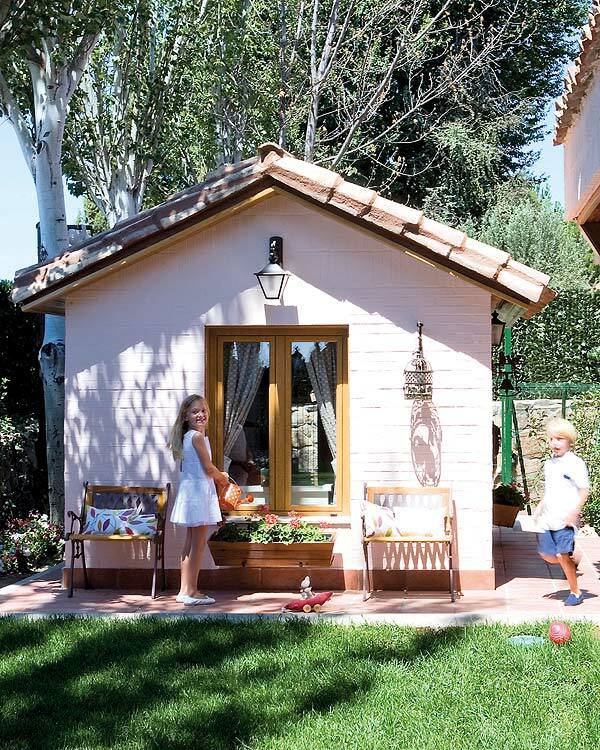 The decoration used in this cute kids playhouse is sparse and lively. The lamp is a light brown, with a climbing rope column. Two different clocks are wonderfully placed on the wall, one is a polka dot clock, and the other is a large white and black circular clock. Next to the white clock, there are a couple pieces of artwork. White shelving lines the wall next to the desk, implementing a space for books and knickknacks. This kids playhouse is an absolutely fantastic idea. It gives the kids a wonderful and unique place to play, and gives them their own little home in the backyard.